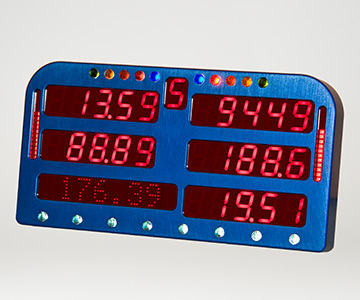 The LED dash is a large character user programmable display that interfaces with any EFI data logger. The enclosure is billet machined 6061 aluminium that is environmentally sealed and features an Autosport rear mounted 22 pin main connector. The SWD has 5 programmable display fields and 4 driver selectable pages. There are 10 programmable LED's for the shift lamps and 2 user defined bargraphs. Channel alarms are displayed in the 8 character message center along with alarm LED's to warn the driver of potential system errors. Alarms can be cleared at any time using the SW1 input. The SW1 input is also used to reset the fuel used data by holding it down for 2 secs. The SW2 is used to cycle through the display pages. Dimensions: 6.48" x 3.35" x 0.70"